Classy evening out whilst you're travelling but you don’t have the space to pack a lot of shoes? Take QUARTZ FINO SLIDE (by FitFlop) with you and leave all your worries behind. 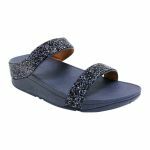 This classy slide can go from day to night providing your feet with all the comfort of a 'comfort' whilst still remaining stylish, fresh and glitzy! Dazzle a crowd by paring these slides with your favourite glitzy kaftan and feel like the queen that you are!